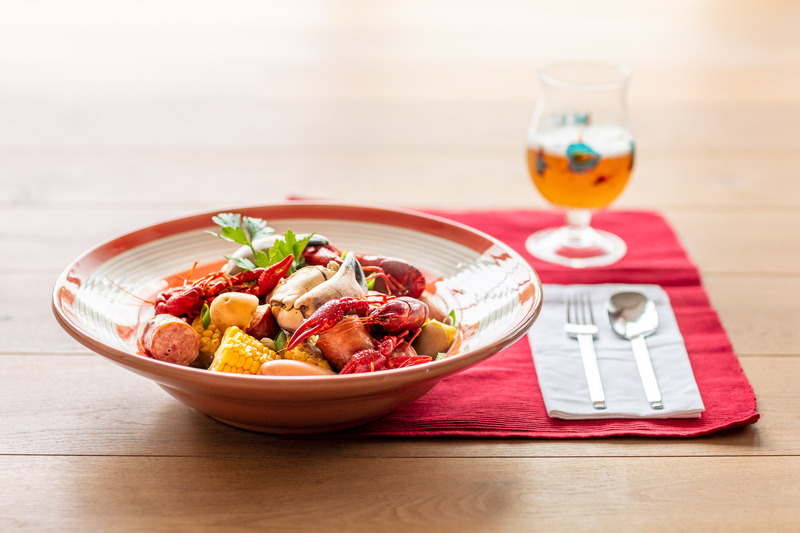 Low Country Boil, which is sometimes referred to as Frogmore Stew, is a simple seafood stew. It originates in Louisiana, somewhere along the banks of the Mississippi. It uses seafood that is found in abundance in the Mississippi delta: crawfish, crab, large shrimp. Traditionally, corn, potatoes and Andouille sausage are added. All ingredients that come quite cheap in that region of the US. Some of the ingredients are not always easy to find in Belgium. Some might not be as cheap as in the US. Check your local food stores or supermarkets, and you will find most ingredients. I buy the crawfish, crab and shrimp at Makro: you can find both frozen and fresh seafood there. You’ll find Old Bay seasoning in American expat shops for sure. I buy mine at Graré in Antwerp. Andouille sausage is very hard to come by, but I’ve found that Polish sausage comes close. So I substitute the Andouille sausage with Polish sausage I buy at Makro. Remove the husks from the corn and chop each cob in to 6 pieces. Clean the potatoes and cut into bite size pieces; no need to peel them. Clean the onion and cut in to 6 wedges. Rinse the lemon with plenty of water to remove dirt and possible chemicals and cut into 6 wedges. Put the potatoes, corn, onion and lemon wedges in a large pot and cover with water. Season with 3tlsp of Old Bay, 1tlsp of cayenne pepper, 1tps of smoked paprika 2 bay leafs and salt and pepper to taste. Bring to the boil. If you are using fresh seafood, add your fresh crab and fresh crawfish now. Cut the sausages in bite size dice. About 20 minutes in to the boil, add the sausage. This would also be a good time to add your seafood if you are using precooked and frozen seafood. Make sure your seafood is completely defrosted before you add it. Cook for a further 10 minutes or until the potatoes and corn are done. Turn off the heat. When you use fresh prawns or frozen but uncooked prawns, add them now. The residual heat will cook the prawns in a matter of minutes. The prawns are cooked when the are pink on the outside. I recommend to use fresh or frozen but uncooked prawns because precooked prawns get really chewy when you reheat them. If you’re using frozen prawns, let them defrost before adding them. When the prawns are cooked, you’re ready to serve. Best way to serve it? On a large platter in the middle of the table so all your guest can dig in and share. A good beer and some fun stories with the dish will get a party stared for sure. But if it needs to be a bit posh, serve it in a bowl and top it will some spring onion and a parsley. I guess everyone knows I’m a bit of a foodie. I like to spend time in the kitchen cooking for friends or trying out new recipes. And on occasion, I’ll set out to try and get a nice photo of the food I’m serving. Like this steamy bowl of mussels I prepared the other day. 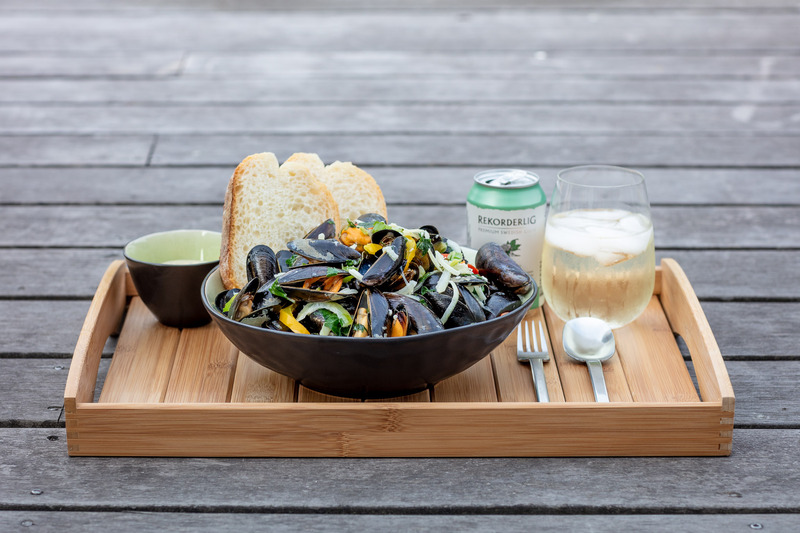 I know it is nothing fancy, but is there anything more Belgian than mussels? 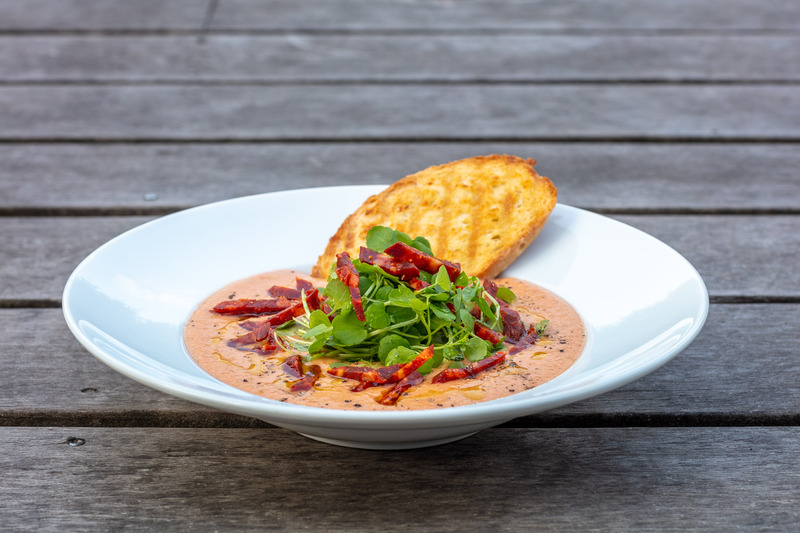 My homemade gazpacho is a quick and easy dish, very refreshing… The ideal dish for a hot summer’s day. And you don’t even have to be in Spain to enjoy it. It takes about 15 minutes to prepare. So why don’t you give it a go? Peel your tomatoes and the cucumber, chop in to bite size chunks, and put them in a blender. Peel the red onion and chop it. Peel the garlic. Chop up the green pepper. I don’t bother to deseed it. But if you don’t like spicy food, take out the seed. It will be less spicy. Add the chopped onion, garlic and the green pepper to the blender. Remove the crust of the bread and chop it in bite size chunk before adding it to the blender. Add a couple of table spoons of good olive oil and vinegar. Blend until smooth. Check for seasoning and add salt and pepper to taste. Give a quick blitz and then chill in the fridge for at least an hour. Before serving, top it with some watercress and julienne of chorizo. And serve it with some toast. Use a dense white bread. I like to use Colruyt‘s Swedish white bread. 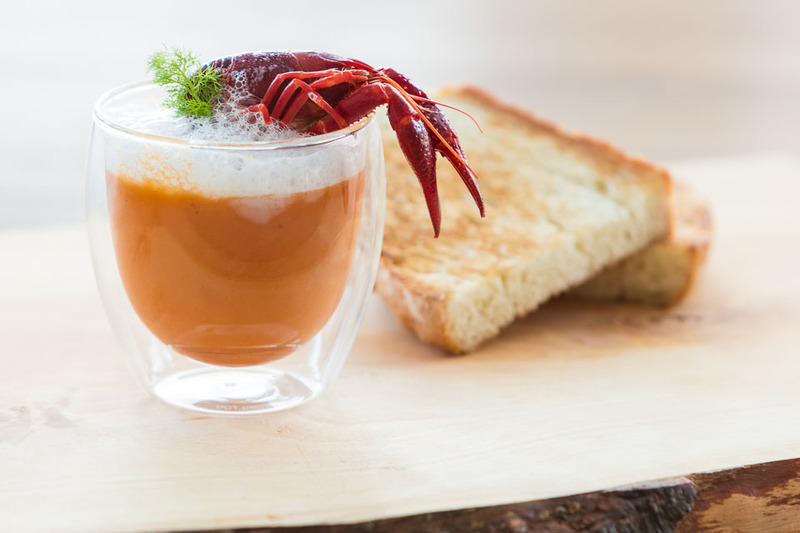 Gazpacho is the prefect recipe to use that leftover bread that is a few days old by-the-way. Don’t know how to peel tomatoes? Check out this YouTube video. Dazzle your friends with a very summery salad. 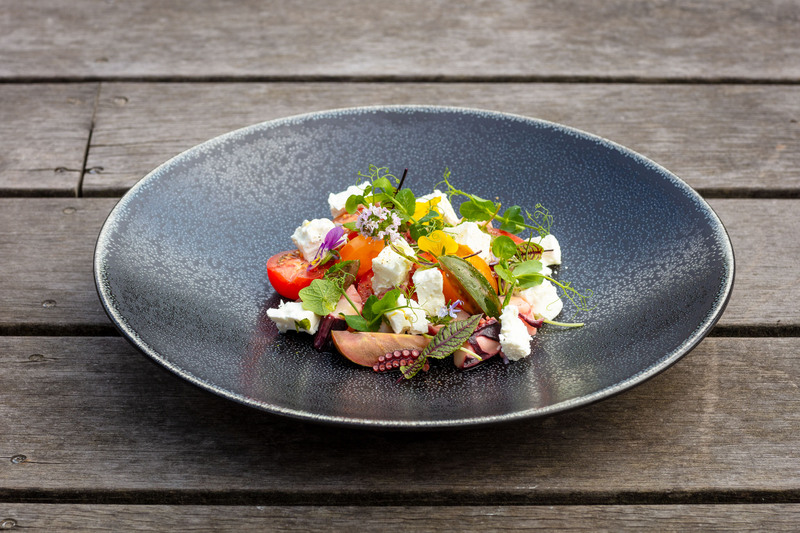 This salad with octopus, tomatoes and feta looks impressive but it takes minutes to assemble. I used store bought marinated octopus, a selection of tomatoes in different colors–make sure they are juicy and ripe–and good feta. Sprinkle on some salt, black pepper and some extra virgin olive oil, and you’re almost set. The part that impressed people the most, are the little additions: pea shoots, violets, watercress, rosemary and thyme flowers, monks cress and beet leaves. And the cool thing about it is, you can grow all those in your own garden. I do! 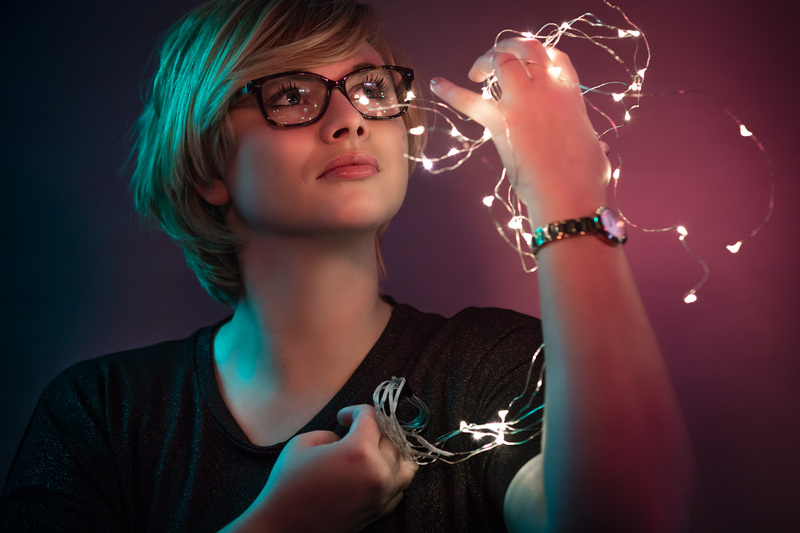 I’ve been looking at the amazing work of Brandon Woelfel and Josefien Hoekstra the last couple of months. 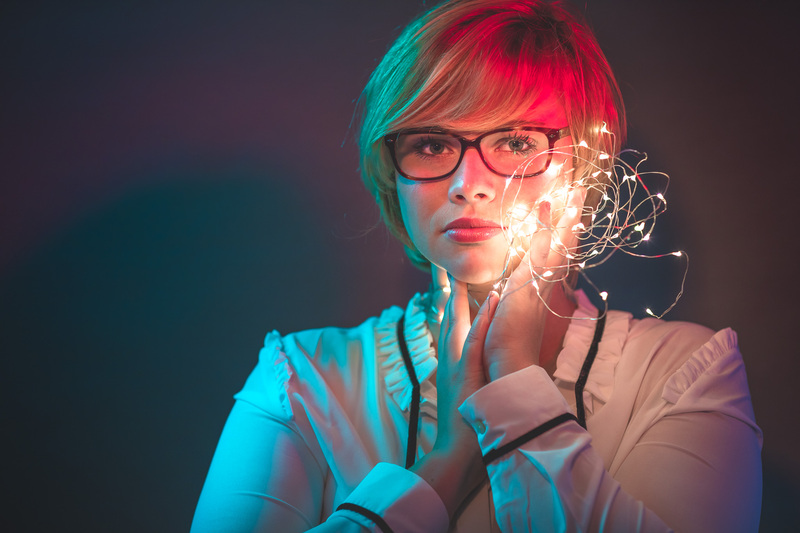 I love their post processing, color toning, Josefien’s use of latex and in the case of Brandon Woelfel I love how he plays with those small led lights. 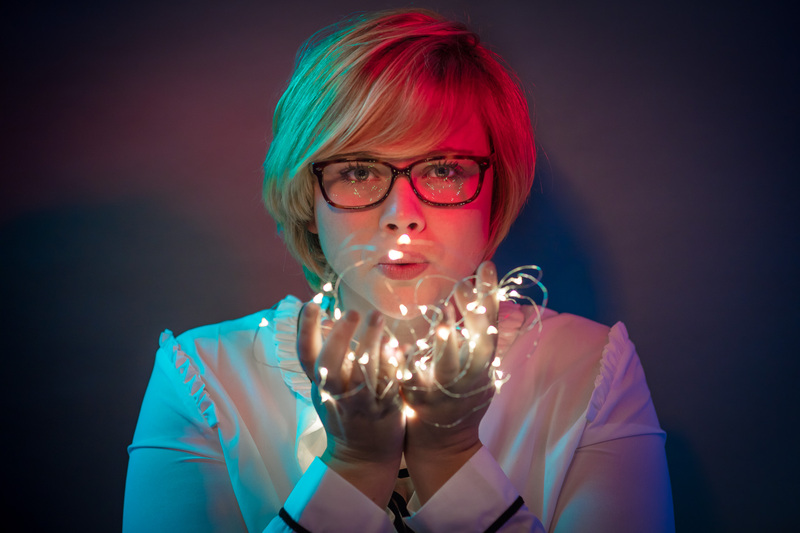 I have already been playing around with color gels on several occasions. And I’ve been reading up on the topic of led lights. I had originally planned to use Christmas lights for the experiments. But I quickly learned that the wires used in Christmas lights are way too thick and that even the smallest of those lights are too big. 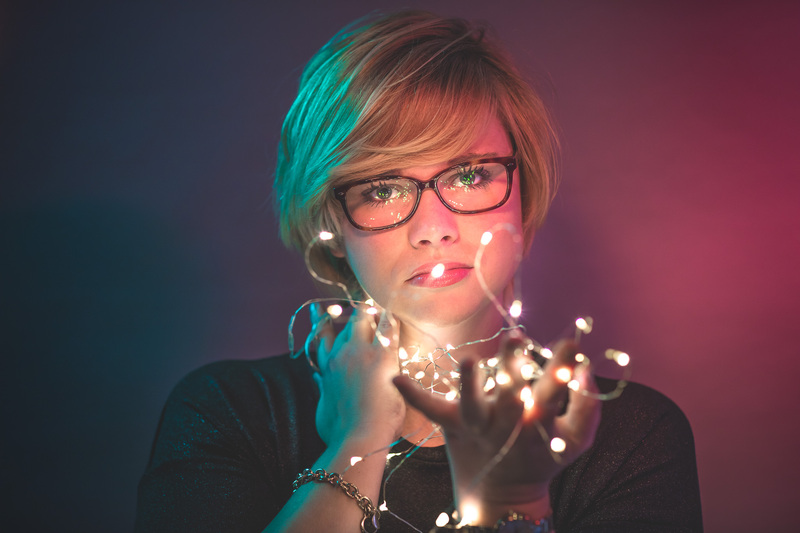 I still have a lot to learn, but these couple of shots I did with Monica are pretty cool. Taking that trip to Tennessee in the spring all started when I said wanted to visit the Jack Daniel’s distillery someday. That someday turned into very soon. And early this year, that very soon turned into this year. 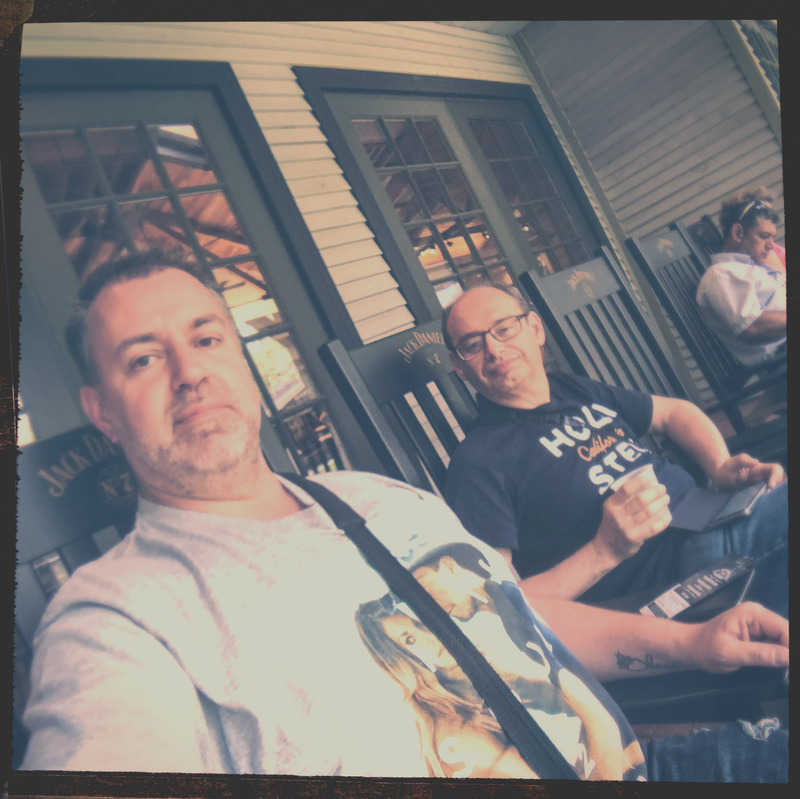 We took a day trip from Nashville to Lynchburg to visit the Jack Daniel’s distillery. We choose their Taste of Lynchburg tour. 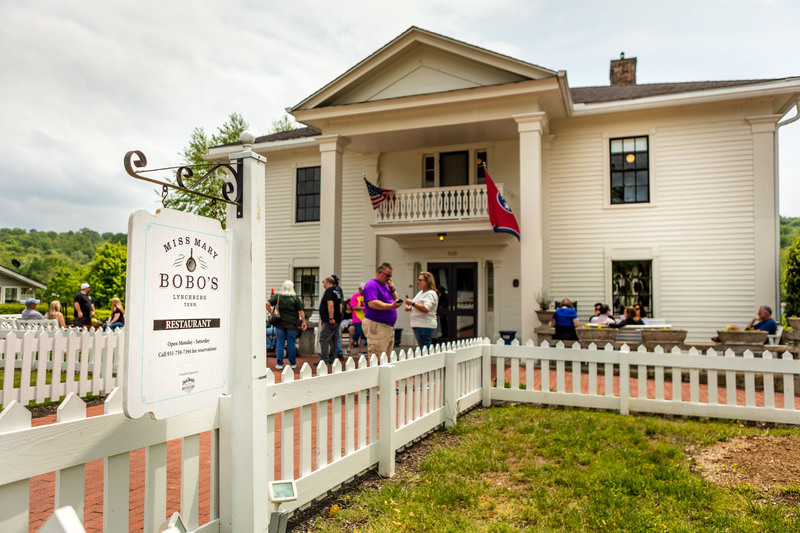 It’s a 3 hour tour that starts with lunch at Miss Mary Bobo’s Restaurant. No, strike that, it starts with delicious lunch at Miss Mary Bobo’s. I will not forget their recipe for candied apples. The tour continues through the town square of Lynchburg, TN and past the cemetery where Jack Daniel and other members of the Daniel family are buried. Then on to the Jack Daniel’s distillery itself. 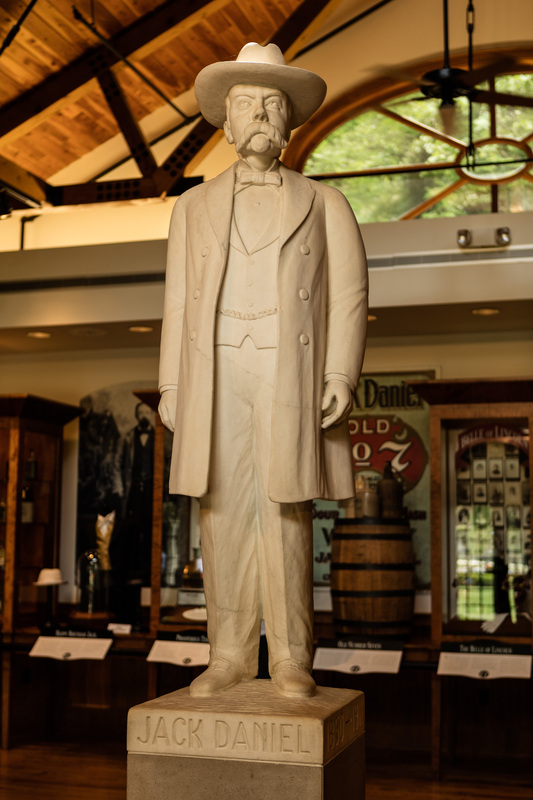 You are welcomed at a little museum that tells the story of Jack Daniel, Lynchburg and the distillery before you embareque on walking tour through the distillery. 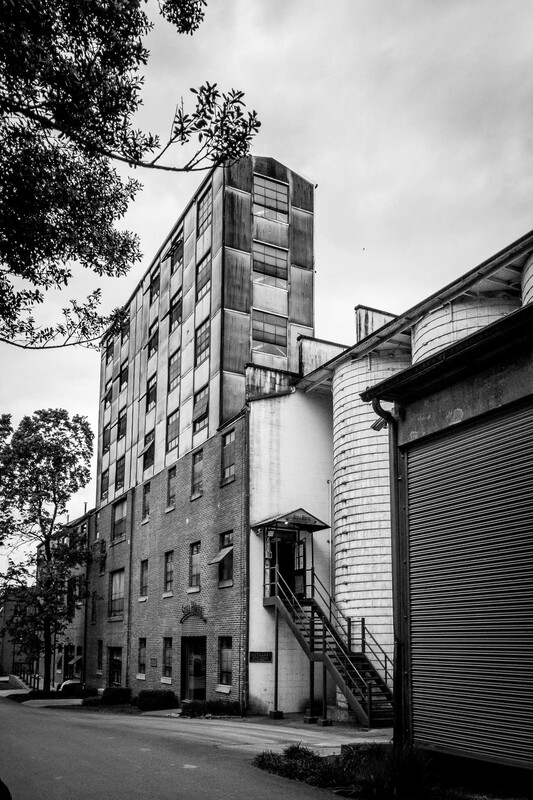 The process of make Jack Daniel’s Tennessee Whiskey is pretty much the same as any other distilled drink. But it is particularly nice to see the purification process through charcoal and how they treat the barrels to get the typical taste of Jack Daniel’s. 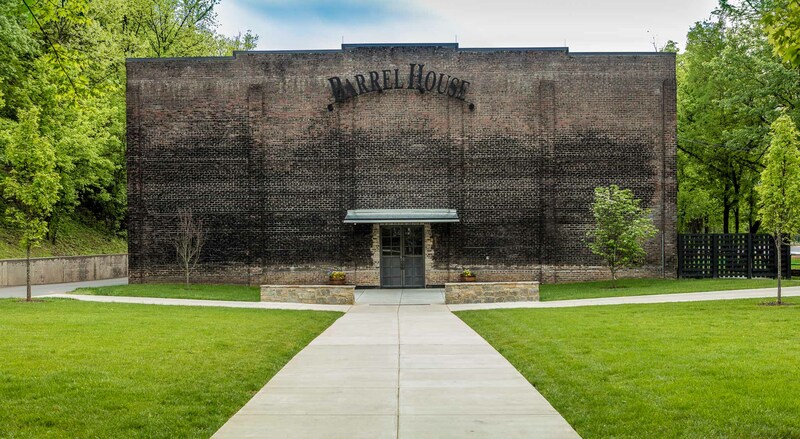 The tour ends at one of the more than 90 barrel houses for a tasting of their finest whiskeys. And after that, you can rest content in a rocking chair under the porch of their welcome house. I am continuing to experiment with homemade ice cream. Last week, I found some fruit purees at a local supermarket. They came pre-made and it quite some exotic flavors. I was a bit skeptic. At first glace, they looked more like juice then puree. But I decided to give them a try. I grabbed a bag of prickly pear–the fruit from a certain type of cactus–puree. It turned out to be a very flavorful puree. Exactly what I would use for making ice cream. Whisk 3 egg yokes and half of the sugar in a bowl until pale and fluffy. Meanwhile combine the heavy cream, milk, the other half of the sugar and the seeds of 1 vanilla pod in a saucepan. 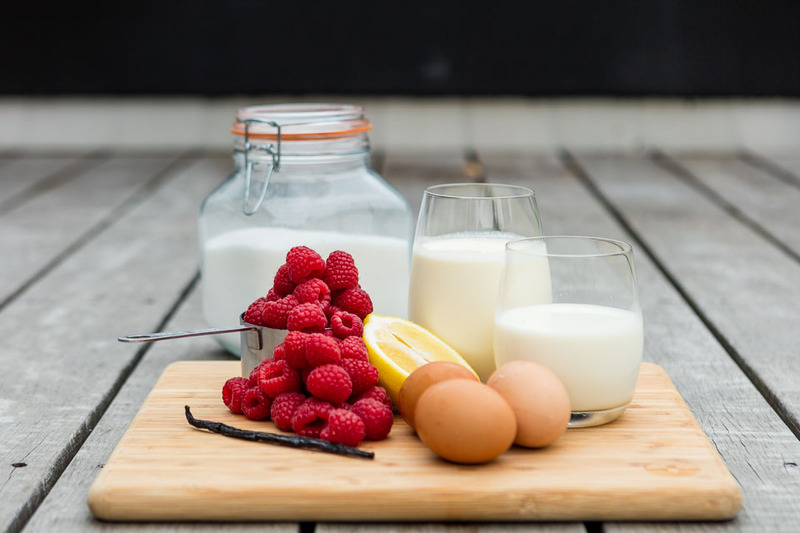 When the dairy mixture is close to the boiling point, add half to the beaten egg yokes while whisking to prevent the egg yokes from setting. Add the eggs and dairy to the remainder of the diary mixture and simmer over a medium heat whisking regularly. Add the cactus puree and a pinch of salt. The mixture will start to thicken much like custard. The mixture will be ready when it coats the back of a spoon. Once ready, transfer the custard to a container, let it cool to room temperature and put in the fridge to chill for at least 4 hours; overnight if possible. To make the ice cream, transfer it to your ice cream machine and follow the instructions of the machine. By popular demand, I will gladly share my recipe for the raspberry ice cream I bragged about on my Instagram last week. Place your fruits, 55gr of sugar and the lemon juice in a saucepan and bring to a simmer. Cook the fruit to a jam-like consistency, then puree and pass through a strainer to get any lumps out. Set the purree aside for later. Put the milk, cream, remaining sugar, a pinch of salt and the seeds of 1 vanilla bean in another saucepan and cook until the sugar is dissolved. Meanwhile, whisk the eggs in a bowl until pale. When the eggs are whisked, add half of the heated milk to mixture whisking as you pour. Now add this mixture to the rest of the milk and simmer over a medium heat to thicken. The custard will be ready once the liquid coats the back of a wooden spoon. Take of the heat and stir in the fruit purree. Let the mixture cool down and rest in the fridge for at least 4 hour or until chilled. 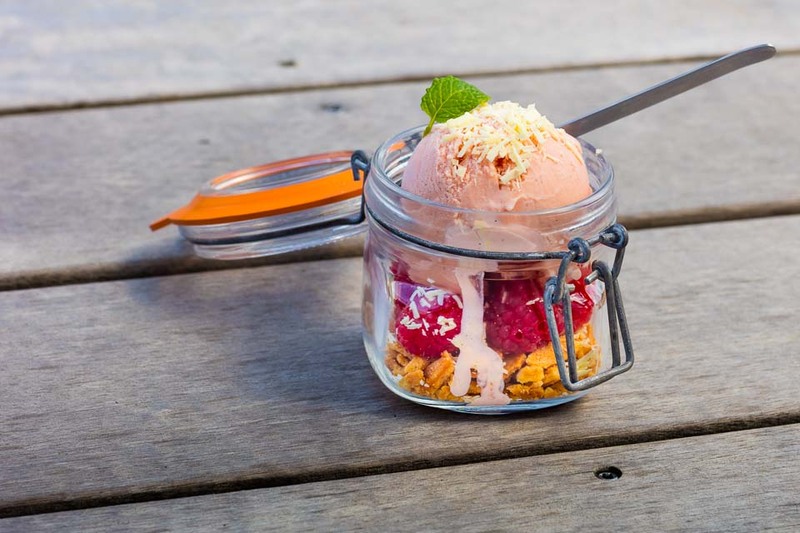 When chilled, add the mixture to your ice cream machine and follow the instructions to make the ice cream. After, freeze it for at least 2 hours in the freezer before serving. Tip: replace the raspberries for blueberries or strawberries. I prefer fresh fruit, but when not available frozen fruit will do nicely as well. Making ice cream is not as hard as it seems. It actually takes no time at all. And the good thing about homemade ice cream is, you can make any flavor you like. 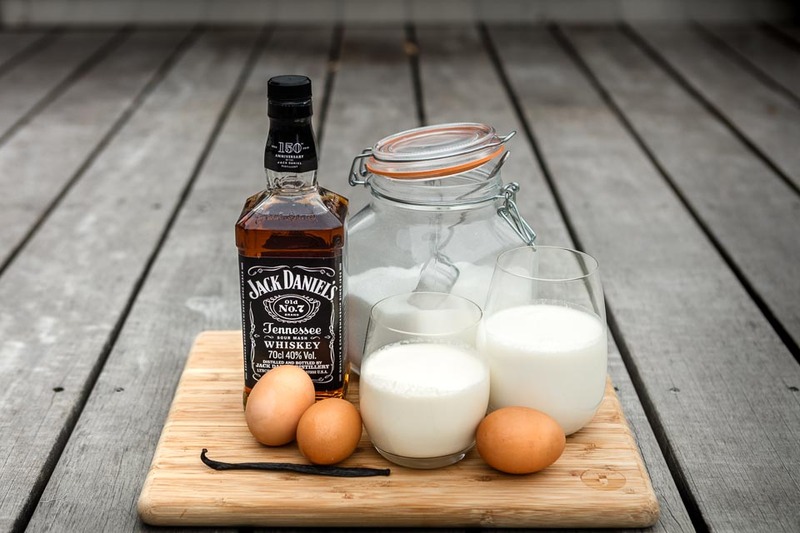 And I happen to love Jack Daniel’s whiskey so I had a go at making Jack Daniel’s ice cream. Pour the milk and the cream in a large sauce pan. Split the vanilla bean in half lengthwise, scrape out the seeds and add to the milk and cream mixture. Bring the mixture up to a simmer on a medium high heat. Pay attention not to burn, stirring occasionally. Meanwhile, add the egg yolks to a large bowl, then add the sugar. Start mixing the yolks and the sugar as soon as you have added the sugar or your yolks will burn. Whisk the yolks and the sugar until pale and fluffy. When the milk and cream mixture is up to the simmering point, slowly add half it to the egg yolk and sugar mixture. Whisk immediately to prevent your yolks from cooking and creating lumps. Add the egg mixture back in with the rest of the milk and cream, and bring back up to a soft boil. It will slowly thicken to a custard-like consistency. Keep stirring to prevent the custard from burning. The custard has the right consistency when it sticks to a spoon. Take the custard off the heat, and stir in the salt and the Jack Daniel’s. Leave the custard to cool in the fridge overnight. Then add the custard to your ice cream machine and follow the instructions to make the ice cream. After, freeze it for at least 2 hours in the freezer before serving. I’m continuing my kitchen experiments and I’m working on my food photography skills at the same time. I had a go at fennel infused foam the other day to top soups.